May 15, 2011 - The airport industry's most influential annual gathering, the American Association of Airport Executives (AAAE) Annual Conference and Exposition, comes to Atlanta today, bringing together top aviation and government leaders to discuss the most significant issues facing airports and their industry partners. 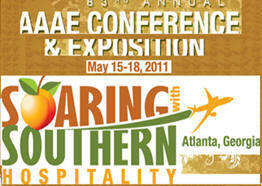 The 83rd Annual AAAE Conference and Exposition takes place today until May 18th, 2011, and will be hosted by Atlanta Hartsfield-Jackson International Airport. More than 2,000 delegates are expected to attend, including representatives of over 200 airports, hundreds of industry suppliers, and key government agencies. The agenda is filled with senior executives from across the aviation and travel industries. Delta Air Lines CEO Richard H. Anderson will keynote the morning session on Monday, May 16. On Tuesday, the agenda includes Avis CEO Ronald Nelson and FAA Administrator Randy Babbitt. TSA Administrator John Pistole highlights Wednesday's schedule. In addition to the keynote addresses, some two dozen educational sessions will take place featuring leading airport executives, senior FAA and TSA officials, and representatives from key suppliers. Among the notable agenda topics are recent airline mergers, the latest in airport security technology, sustainable airport practices, and the impact of NextGen on airports. The conference exhibit hall, the airport industry's largest, is open Sunday evening through Tuesday morning. Inside the hall, more than 180 companies will display the latest products and services aimed at solving today's airport challenges and capitalizing on tomorrow's opportunities. "The AAAE annual conference traditionally serves as an important forum for top industry and government officials to assess the state of the aviation industry and chart a course forward," said AAAE Senior Executive Vice President Spencer Dickerson. "Our strong slate of speakers, led by Richard Anderson, Randy Babbitt, Ron Nelson and John Pistole, combined with the diligent effort of our hosts at Atlanta Hartsfield-Jackson International Airport, make this a not-to-be-missed event for industry leaders seeking insight on how to thrive during a very dynamic time in aviation." "At the conference, you will learn effective new strategies and actionable best practices from some of the smartest leaders from airports around the nation. Engage with old friends and make new connections during a variety of networking opportunities." The AAAE annual conference always attracts thousands of airport and aviation professionals, including airport executives; airport and aviation suppliers and vendors; airline personnel, and representatives from FAA, TSA and DHS. Four days of discussions revolving around the current state of affairs of the airport industry will be supplemented by an exhibit hall with over 250 vendors ready to assist the industry in meeting its challenges with their products and services. Don't miss this once-a-year opportunity to meet with airport colleagues from around the country!